The federal industrial tribunal has been dealing with increasing numbers of individual applicants since the unfair dismissal jurisdiction was transferred to it in 1996, and with the addition of jurisdictions such as the bullying jurisdiction. There has been a relative decline in the Fair Work Commission’s traditional focus on collective disputes. A substantial number of individual matters involve unrepresented litigants. Commission decisions suggest that they may have difficulty in understanding tribunal procedures or the merits of claims, to a greater extent than represented applicants, and this is consistent with other evidence. They raise the question of whether such applicants make and continue applications because of the personal cost of an incident or incidents, rather than merit, to a greater extent than represented applicants. This article details some of the problems that result, and suggests some solutions. One of the more difficult tasks faced by practitioners is to determine the terms of a contract that is as dynamic and uncertain as a contract of employment. Many such contracts include a range of express and implied terms. The express terms are often based on a multitude of representations and the implied terms based upon the conduct of the parties and the contract itself. In recent years, the courts have grappled with questions as to the contractual status of corporate policies and the extent to which they bind either party. This article will show that the answers to those questions are still somewhat uncertain and await an authoritative determination. In Wearne v Victoria, a case manager brought an action in negligence against her employer alleging that she had been bullied and that her employer had failed to provide a safe workplace. Despite a finding that no bullying had occurred, her employer was held liable for the psychiatric harm she suffered. 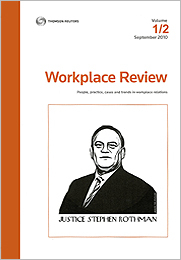 This case demonstrates that employers are obliged to do more than simply ensure that their employees behave reasonably; they are required to implement a detailed management plan for dealing with workplace conflict. Protracted negotiations for a new agreement for the Department of Immigration and Border Protection were terminated recently by the Fair Work Commission and were followed by the beginning of arbitration of a workplace determination. However, proceedings in the Commission promptly ran into further delay when the parties raised objections to evidence based on parliamentary privilege. For the PDF version of the table of contents, click here: WR Vol 8 No 3 Contents.